Located on Saint-Laurent Boulevard in Plateau Mont-Royal, this 1-bed and 1-bath apartment is 675 sq. ft. featuring hardwood flooring, exposed concrete, and private balcony. Building amenities include rooftop terrace, bicycle locker, and indoor parking. Elegant and modern, this 1-bedroom Mile-End condo is ideal as a pied-a-terre or for your next short-term accommodation in the city. 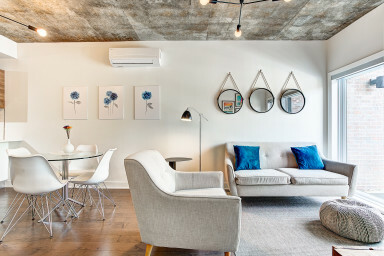 The fully-furnished living space offers an inviting open-concept design with all the creature comforts of home, including wall-mounted air-conditioning, unlimited high-speed Wi-Fi, free local calling and cable television. Relax in the sunny den area that gives access to the private balcony directly overlooking The Main, and entertain friends with a 4-person dining table. Enjoy home-cooked meals thanks to a U-shape kitchen, fully-equipped with stainless-steel appliances, high-end fitted cabinetry, quartz countertops, and complete cookware, and when you need some peace and quiet; the closed queen-size bedroom features superior soundproofing as well as a personal office corner for any business needs. Enjoy luxury finish in the designer bathroom such as Zen sink, custom tiling, and tempered-glass walk-in shower, and Unit #1011 also includes high-end stackable washer/dryer for your added convenience. Staying in Montreal really is this simple with Simplissimmo! Completed in 2015, the 4-storey Le Milieu building is centrally located and offers elevator, garbage shoots on each floor, bike lockers, and indoor parking garage. Residents staying here also have exclusive access to the shared rooftop terrace with panoramic views of the city. Easily the hippest and most vibrant neighborhood in town, this address puts you in the very heart of all the action, and absolutely spoils you for choice of fun things to do and see. With services, cafes, boutiques, popular restaurants, bars, and clubs around every corner, the Mile-End is a true walker’s paradise and a daily destination for the city’s young creative professionals. The vibe is laid-back, and this is where the flourishing gaming industry and new media types have taken up shop. In the immediate area, start the day with a visit to Café Olimpico and St-Viateur Bagel for coffee and a world-famous bagel. The buzzing environments of places like Fabergé, or The Sparrow serve up phenomenal brunches, and why not enjoy a traditional high tea in the Cardinal Room just upstairs! For dinner, head over to the trendy Maïs for an eclectic Mexican-inspired menu, or Estiatorio Milos is one of the top fine-dining establishments in the city. At night, when it’s time to party, the casual Dieu du Ciel is always packed with friendly beer lovers, Chez Serge gets wet and wild on hockey nights (including a mechanical bull! ), and the stylish Ping Pong Club just up the street has got free table games, great music, and slush cocktails. Mile-End is most definitely where all the cool kids hang out!